This may be the shortest reminder I've posted this year, but it seems that the Christmas season has arrived and everything needs to be done at the same time! One of the things I hope you've put on your to-do list is joining the rest of the Shiloh Singers at the Shiloh Museum's General Store on Sunday afternoon, December 13th, from 1:30 until 4:00 P.M. There are songs to sing and good friends to join to celebrate the last monthly singing of 2015. It's been a great year for the singers. Thanks to all of the Shiloh Singers, the Shiloh Museum of Ozark History and staff, guest instructors at our annual singing school and all our visitors and other guests to helped make it such a great year. Best wishes to the singers in Oklahoma and South Central Arkansas for the New Year. We hope to see you again in 2016. Those who attend on Sunday are also invited to bring a few extra Christmas cookies, fruitcake, or other special desserts for the break. And for those who still need to shop for that special someone, the large shopping malls to the north, south and near Springdale will still be open after the singing. As always, the any early arrivals are still welcome to join us at AQ Chicken House in Springdale around noon on Sunday before the singing. Just ask for the singers at the front desk. Visitors and friends are always welcome to join us at our Sunday singings and sing some of the Christmas songs at this special time of the year. Hope to see you there. "God made time so that we don't have to do it all in one day." This has been one of those weeks when neither my schedule, the Greek financial bailout, nor the famous Italian trains would have run "on time." The best thing I can say about this week is that the Shiloh Singers will be meeting and singing in the General Store on the grounds of the Shiloh Museum in Springdale on Sunday afternoon, Aug. 9th, at 1:30 and we'll all get to sing in the company of friends. That's always a good way to end a busy week. We also need to discuss and start planning for the October NW Arkansas Sacred Harp Fall Singing Convention and Singing School on October 23rd and 24th. Thanks to Syd Caldwell and the always helpful staff at the Shiloh Museum of Ozark History, Much of the planning framework has already been sketched out. 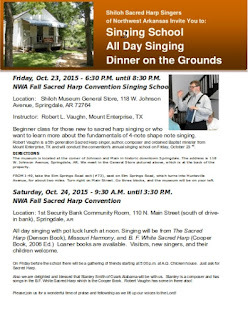 Syd has arranged for Robert Vaughn, a 5th generation Sacred Harp singer, author, composer and ordained Baptist minister from Mount Enterprise, TX to conduct the convention's annual singing school on Oct. 23rd, the evening before the all day singing on Saturday. In fact, this weekend, Robert will be leading and singing at the 148th East Texas Convention in Henderson, TX. Photo: Robert Vaughn leading the singers at Historic Washington (AR) United Methodist Church on March 22, 2015. 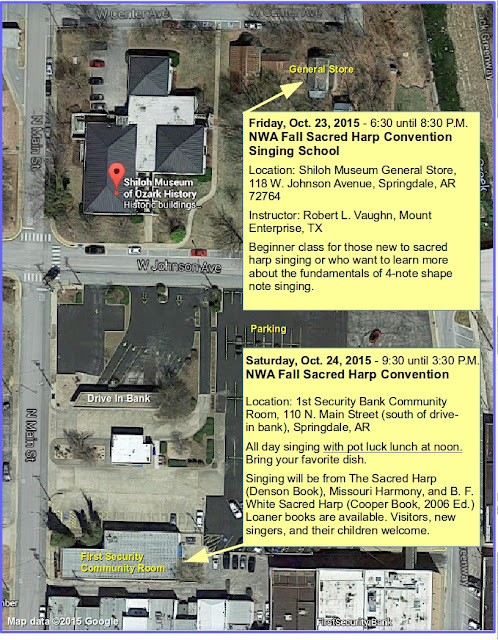 Beginner class for those new to sacred harp singing or who want to learn more about the fundamentals of 4-note shape note singing. Location: 1st Security Bank Community Room, 110 North Main Street (south of drive-in bank), Springdale, AR 72764. All day singing with pot luck lunch at noon. Singing will be from The Sacred Harp (Denson Book), Missouri Harmony, and B. F. White Sacred Harp (Cooper Book, 2006 Ed.). Loaner books are available. Visitors, new singers and their children welcome. For those of you who instantly recognized that on Saturday, Oct. 24th, the University of Arkansas Razorbacks will play the Auburn Tigers in Fayetteville. Unless there is a late October hurricane or an early winter snow storm, there's an excellent chance that most hotels and motels will approach their capacity on Friday and Saturday nights. While there are at least 20 hotels and motels listed by Google in the Springdale area, if you plan to stay overnight in the Fayetteville/Springdale area on a Razorback football weekend, please consider making your room reservations earlier than normal this year. To help that process, Syd has reserved two small blocks of rooms in Springdale in his name with premium or budget rates for the event, but the convention rates are only good for a limited time: the HOTEL RESERVATION DEADLINE IS AUGUST 21, 2015. After that, the block of rooms will be released and regular room rates will be in effect based on the market and availability. Singers who earn points with a favorite hotel or motel chain or use their favorite hotel booking agent like Expedia or Trivago can use their own system to search for competitive rates on their own, but please start early! As we get closer to the actual singing convention dates, I'm sure there will be additional information and I'll post the usual maps and a flyer you can download, print and share on the Shiloh Singers website. And if the schedule works better next week, I may actually get a chance to post some of the other items I had planned for this month's edition of the newsletter. Watch this space. Photo: Dan Brittain teaching the next generation of shape note singers at the July 11th Ozark Folk Center Shape Note Gathering. One more thing: For those who plan to attend the Aug. 9th singing and can get to the AQ Chicken House in Springdale around noon or a little later, there's an open table of Shiloh Singers usually in the back enjoying one of AQ's many fine dishes before the singing and catching up with friends and fellow singers. There's also coffee and ice cream at Denny's after the singing. Both events are open to all singers and we can usually add chairs or bump more tables together if we need more space. You are invited. A short introductory singing and discussion at 6:00 until 6:45 P.M. to introduce the event in the small White Oak Auditorium located in the Administration Building. Folks can go to the main show in the theater and buses will be available afterwards to take attendees directly to the main auditorium for the evening program. July 10, Friday - On the stage of the Folk Center Auditorium, a presentation of all the oblong shape note books in use today. We will have samples from each to sing from. 7:00 P.M. - The singers will sing as part of the regular Friday evening show. July 11, Saturday- An exciting new event for the Folk Center as part of the weekend gathering. There will be an All-Day singing at the Stone County Historical Society in the Old High School Building at 204 School Ave., just off of Main Street in Mountain View. Then on Sunday, July 12th, knowing that not everyone can get to Mountain View on Saturday, we still plan on having our regular monthly singing in Springdale in the General Store from 1:30 until 4:00 P.M. following the normal Sunday schedule. 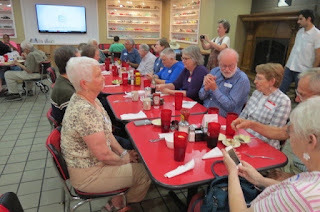 The normal lunch group will be at AQ's Chicken House around noon for lunch and we'll see who might be available for post-singing pie and coffee at Denny's near the Interstate afterwards. This really sounds like a good four days of singing and I certainly hope you can sing at one or more of the events. We'll also bring an extra fan or two to keep things as cool as we can. Photo: Cory Winters leading the Shiloh Singers on June 14th in Springdale at the Shiloh Museum's General Store. 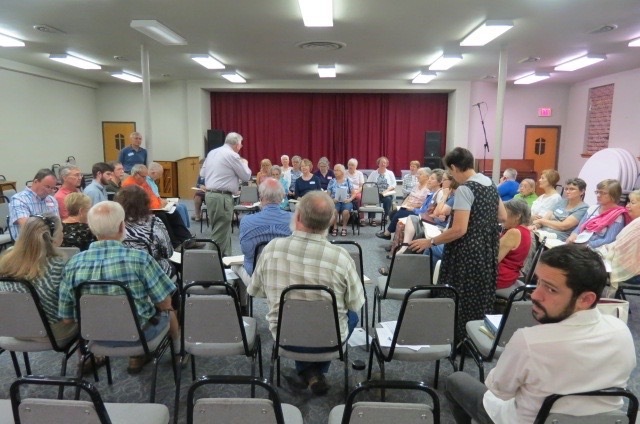 In Other News - The Shiloh Singers get-together on Sunday, June 14th, enjoyed a good turnout with 20 singers. The fans kept things fairly cool. Thanks to all who attended. Shut-ins - Holly Childs, one of our faithful tenors, has spent several days in the hospital after surgery and her daughter, Lisa, has reported positive results and a good prognosis for getting back home in the next few days. Prayers for her speedy full recovery will be appreciated, I'm sure. Holly, we'll miss you this Sunday, but hope you'll feel better by our August singing. Please let us know if there are others that need to be added to the prayer list for the Sunday singing. That's about all the news I know to print. We hope we'll see you in Mountain View or Springdale this long singing weekend. It has been a long time since we've joined together to sing. May 2nd in Harrison for the NWA Sacred Harp Singing Convention was almost six weeks ago, and after all the rainfall last month, I hope that all of the Shiloh Singers have a chance to enjoy a wonderful drive through the Ozarks' thick green forests on Sunday, June 14, 2015. The destination is the Shiloh Museum of Ozark History's General Store to sing from The Sacred Harp and the Missouri Harmony from 1:30 to 4:00 P.M. The temperature is expected to be in the 80's with an occasional shower to cool things down. For those who can get to Springdale around noon, the ad hoc lunch group will gather at AQ Chicken House on Hwy Bus. 71 for lunch and catching up with news of family and friends. All are welcome, bring a friend and enjoy the afternoon with singing. First of all, our thanks to all who participated in the Harrison event, the cooks who brought their best dishes and desserts, to Dan Brittain who has been the guiding light behind this annual event and the congregation of St. John's Episcopal Church who generously opened their doors to provide such a wonderful place to sing. I'm sorry if you were unable to attend. We had a good time but you were missed. The month of July is not far away and we have several events to talk about. First, the annual Ozarks Folk Center State Park Shape Note Gathering, scheduled for July 9-11 in Mountain View, AR. The instructors for the school and singing will be Gaylon Powell and Dan Brittain, both well known in the nationwide Sacred Harp and Shape Note world. Holly Ruth Gale and Charley Sandage will assist. July 9, Thursday evening - A short introductory singing and discussion at 6:00 until 6:45 P.M. to introduce the event in the small White Oak Auditorium located in the Administration Building. Folks can go to the main show in the theater and buses will be available afterwards to take attendees directly to the main auditorium for the evening program. July 10, Friday - On the stage of the Folk Center Auditorium, a presentation of all the oblong shape note books in use today. We will have samples from each to sing. Teachers can also earn in-service credit for participation on Friday. 7:00 P.M. - The singers take part in the Friday show. July 11, Saturday- An exciting new event for the Folk Center as part of the weekend gathering. There will be an All-Day singing at the Old High School Auditorium. One half of the day will be devoted to the 1991 Denson Book, the other half to the Christian Harmony. Location: Old Mountain View High School Auditorium (Stone County Historical Society), 204 School Avenue, just off of Main Street in Mountain View. Then on Sunday, July 12th, knowing that not everyone can get to Mountain View on Saturday, we still plan on having our regular monthly singing in Springdale in the General Store from 1:30 until 4:00 P.M. following the normal Sunday schedule. 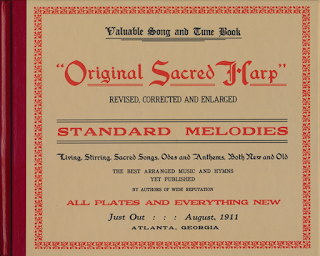 One more thing: Thanks to Allyn Lord, Director at the Shiloh Museum who forwarded the announcement of the reprinting of the Original Sacred Harp tune book originally published in 1911. The singers at Harrison in May actually had a chance to see a copy of the reprint. It's a piece of history some of you may want to keep in your personal library. "We've just published this commemorative reprint of a much-loved 1911 historical edition of The Sacred Harp, with a new introduction on the book’s legacy and context. Edited by Jesse P. Karlsberg, this Centennial Edition of Joseph Stephen James's Original Sacred Harp" makes newly accessible a trove of engaging music and James’s fascinating historical notes on each of the book's 609 songs." Learn more historical information about the book: "Old Strings on a New Harp" by Jesse P. Karlsberg. To order a copy of the book, visit The Sacred Harp Publishing Co: "Original Sacred Harp: Centennial Edition" publisher's page. 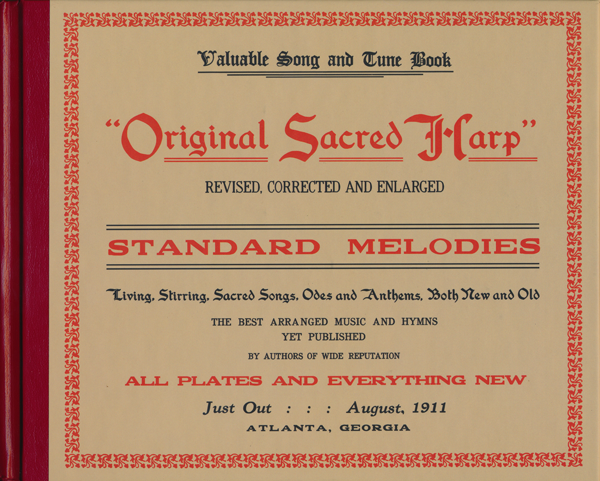 Photo and text from the Sacred Harp Publishing Company, May 13, 2015. And a personal note: Several of the regular singers already know that the Shiloh Singers mailing list has grown in size to the point we had to split the database into two smaller mailing lists to keep from apparently exceeding Google's limits on non-commercial mailings. Later, we found that some of the email names and addresses were corrupted at some point before, during or after the conversion process. I'll spare you the details. However if you know of a singer who no longer gets the Shiloh newsletter and should, or a new singer who registered and never got a newsletter, please let me know or encourage them to resubscribe. I've been working with computers since the days when dinosaurs like the big IBM's roamed the earth and sometimes their smaller cousins - Windows, Macs and Linux - still win. We hope to see all of you who can get to Springdale on Sunday. We'll make a joyful noise and have a good time. 2015 NWA Convention Flyer. Click on image for printable full-sized PDF version. 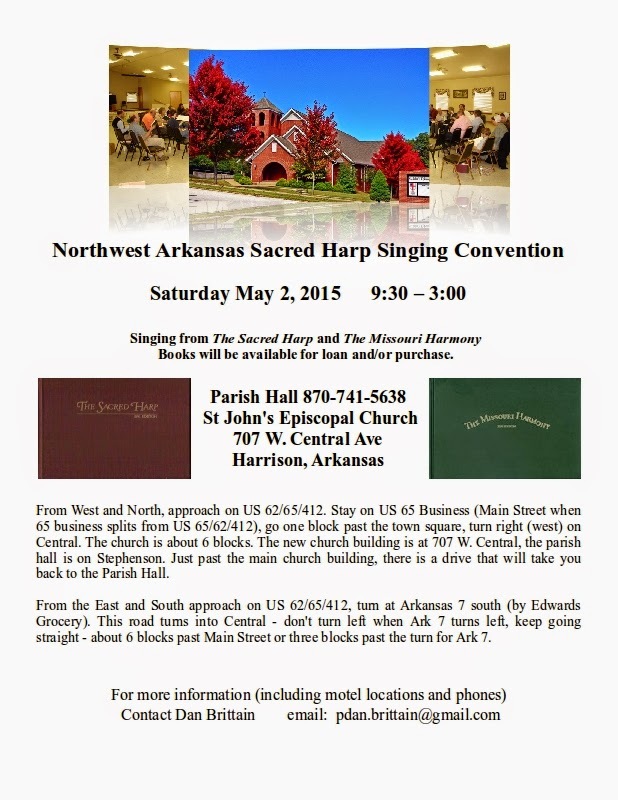 Our newsletter is published earlier than the usual monthly reminder to give all of the NW Arkansas Sacred Harp Singing Convention on May 2, 2015 in the Parish Hall of St. John's Episcopal Church in Harrison AR. The church is located at 707 W. Central Avenue and directions are found in the attached flyer. This special spring event starts at 9:30 A.M. and continues until 3:00 P.M. with a break at noon for a pot luck lunch. 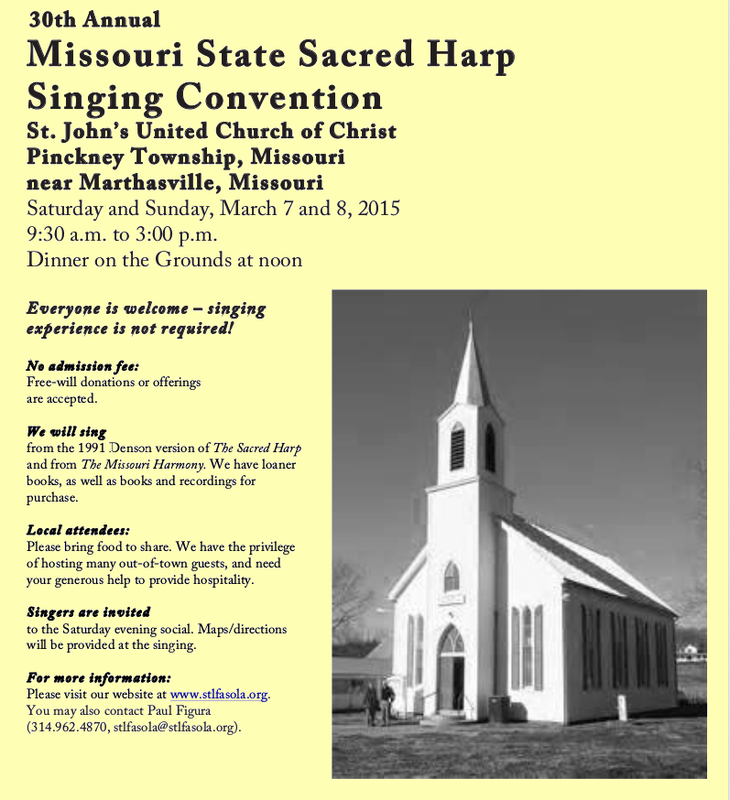 Singing will be from The Sacred Harp (Denson book) and The Missouri Harmony. Loaner books will be available. The Harrison singing traditionally has been well attended by singers from Missouri, Oklahoma, sometimes from Texas and from all over Arkansas. As usual, visitors, children and new singers are always welcome. The pot luck lunch is always a special treat and St. John's Parish Hall has a well equipped kitchen with refrigerators, microwaves, etc. to help keep things cold or warm dishes to serving temperature if needed. Singers are invited to bring their favorite meat dishes, casseroles, salads and desserts. Others may wish to bring a cooler and soft drinks. At the moment, we're well supplied with cups, dishes, plastic ware, napkins, thanks to Gail Cowart. Our host, Dan Brittain, usually has the coffee pot perking by arrival time. Donuts to go with the coffee or fruit plates for the morning arrivals or breaks usually travel well in a cooler. As to motels and hotels, I never did find one website that had all the information about accommodations in one spot. Things like name, location, map, phone number, rates and ratings that were the staple of paper AAA travel guides apparently don't always translate easily into web pages. Harrison's Convention and Visitors Bureau has the most comprehensive descriptions I found on the web (but no maps or rates). 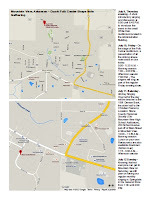 The best map of where the motels are actually located is found on HotelGuides.com. I ended up checking Trivago for distance to the downtown area, rates and ratings. If you have a favorite booking agent, Priceline, Expedia and others are also linked from the Trivago site. If you collect Wyndham, Choice Hotel, or other travel points, do your own thing. With thanks to Dan, who supplied the new picture (in color) for this year's flyer so you can easily identify St. John's Episcopal Church, is our final word on directions, motels and phones. Drop an email to Dan at pdan.brittain@gmail.com if you have questions or need more help. At the April 12th singing at the Shiloh Museum of Ozark History, several singers brought up the point that our usual May 2nd Sunday singing date would arrive on Mother's Day. Mother's rule! Those present quickly concurred that the May 10, 2015 singing at the museum was canceled and we should still spend time with our mothers, family and friends on Mother's Day. The next regular singing will be on June 14th. Map: Downtown Harrison. Click on image for larger version. The information we included in the April newsletter regarding the annual Ozarks Folk Center State Park Shape Note School and Singing scheduled for July 9-11 in Mountain View, AR has been posted on the Shiloh Singers calendar. I'm sure we'll talk about the Thursday evening through Saturday event, but I'm hearing some favorable discussions about the Saturday, July 11th, singing in the Old High School Auditorium. See the webpage for the known details. One More Thing: If you know of a singer who might be interested in attending the NW Arkansas Sacred Harp Singing Convention, share a copy of the flyer with them, or post a copy on the church or choir bulletin board, or even better, bring them with you. We've always had a good singing at Harrison, no matter what the weather, good people getting together to enjoy singing has always turned out well. Hope you'll join us in Harrison on May 2nd. It's that time of the year when those among us who have done their taxes can rejoice that the task is completed. Those of us who are using a new tax software application are still trying to figure out new features and directions. I hope that everyone is either finished or close enough to being finished that we can all take a Sunday afternoon break on April 12th and come to the regular April singing in the general store at the Shiloh Museum of Ozark History. The singing will start at 1:30 and will continue until 4:00 P.M. The usual before singing and post singing get togethers starting around noon at Springdale's AQ Chicken House, and dessert somewhere after the singing. All singers and visitors are welcome to sing along or just watch and listen. Photo - The singers at the 2015 Missouri State Sacred Harp Singing Convention at St. John's United Church of Christ in Pinckney Township near the Missouri River. During the past month, members of the Shiloh Singers participated in singings near Washington, MO and Old Washington, AR. The Missouri State Convention gathered participants from all over middle America. The bad weather along the eastern side of the Mississippi River kept some of the regular attendees from making the trip from Georgia and Alabama, but we hope to see many of our old friends next year. The St. Louis singers do a marvelous job with both the singing and the Saturday and Sunday meals and have earned the appreciation of all who attended the 2015 edition of their event. The afternoon singing in Washington, AR was only the second year of a special event held in conjunction with the annual Jonquil Festival hosted by the Historic Washington State Park. Saturday, March 21st, was bright and sunny with the Jonquils all looking their best and great attendance. Sunday had intermittent rain and cooler weather but the warm welcome from the singers and the curious on-lookers in the Historic Washington Methodist Church made up for the weather outside. Photo: Robert Vaughn explains the basics of shape note singing at the 2015 special singing in the Old Historic Methodist Church at the Jonquil Festival at Historic Washington State Park on March 22nd. Thanks to all the singers from Arkansas and Texas who attended. Discussion after the singing trended toward maybe having a similar event next year with an all day format and lunch at the state park. The Historic Washington State Park and surrounding community is a special place in Arkansas history and a special place to visit any time during the year. Update 4/11/15: I got a note from Bob and Gina Cauley who now live in Divide, CO but sang with the Shiloh Singers when they lived in Arkansas. If any of the singers on the newsletter list happen to be headed out to Colorado during late April, the Colorado Springs singers have planned an all-day singing and pot luck lunch for Saturday, April 25th, (9am-3pm) at Chapel of Our Saviour, (in Broadmoor) 84th Street, Colorado Springs, CO 80906. The contact for the event is Mary Margaret Alvarado at:marymargaretalvarado@yahoo.com You can "google" the address for a map. Please let me know if you can attend and I'll pass along additional info. OK folks, mark your calendars now so there is no confusion! Dan sent me a note that Mountain View Shape Note Gathering is scheduled for 9-11 July at the Ozarks Folk Center State Park. Thursday evening - a short singing at c. 5:30 to introduce the event - the small White Oak Theater (over by 6:45 so folks can go to the main show in the theater). Friday - on the stage of the Folk Center Auditorium - a presentation of all the oblong shape note books in use today. We will have samples from each to sing. The singers will sing as part of the regular Friday evening show. Teachers can get in-service credit for Friday. Saturday- a NEW EVENT for the Folk Center as part of the gathering. All-Day singing at the Old High School Auditorium. Great venue. 1/2 day 1991 book, 1/2 day Christian Harmony. Dutch treat for lunch. More details will follow as they become available. The Mountain View event is an opportunity to gain a wider appreciation for the different variations of shape note singing. It's something to put on your "bucket list" if you haven't been there and the Saturday singing adds more icing on special Folk Center event. Any further updates and additional pictures will be posted on the Shiloh Singers webpages in a few days (after April 15th?). Park your pencils, file your forms in a folder and get away from your computer screen while sharing the tradition of Sacred Harp singing this Sunday. You'll be glad you did. The Shiloh Sacred Harp Singers March Newsletter... Opportunities abound! First, a quick reminder that the Shiloh Sacred Harp Singers will be recessed to allow singers to attend the Missouri State Sacred Harp Convention this Saturday and Sunday, March 7th and 8th. We're keeping a careful eye on the weather forecast for the Washington, Missouri area which should clear on Friday with sunny weather with highs in the mid-50's and lows about 29 degrees. While the Interstates toward the St. Louis area are expected to be clear, the secondary roads may require more care. If you're headed that way, please be sure to check the forecast. For more information the Missouri State Convention, see the February newsletter posted on our web page. The Shiloh Singers will reconvene on Sunday, April 12th, at 1:30 to 4:00 P.M. in the General Store on the grounds of the Shiloh Museum of Ozark History in Springdale. Thousands of jonquils welcome craftspeople, entertainers and visitors to the town of Historic Washington. Unique crafts and delicious foods are just part of the attractions from 9 a.m.-5 p.m. on Friday and Saturday, then again from 9 a.m.-4 p.m. on Sunday. Tours of the park, historic homes, and museums are available at regular price. Call the park at (870) 983-2684 for details. I have to admit that I wished we could have spent more time at the festival booths and community attractions when several of the Shiloh Singers participated last year. For more information about the state park and local community attractions, check out the Washington State Park website for pictures, maps, etc. If you're interested in singing at the event, it makes sense to carpool. Please let me know if you're interested and we'll see what we can put together a list plus let Robert know how many from the Shiloh Group expect to attend by sending a quick email to brt.black@gmail.com. 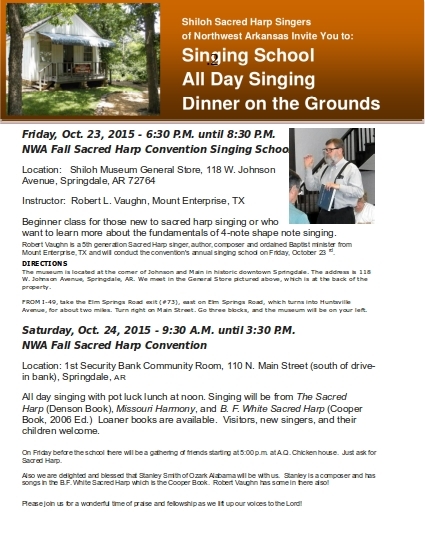 We also hope to have more details about the NWA Arkansas Spring Sacred Harp Convention after discussion in Missouri. In the meantime, stay warm and stay safe. Hope to see you at one of the singing opportunities in the next month. With the January 11th ice storm, the Shiloh Sacred Harp Singers of NW Arkansas will host their first singing of the year on Sunday, February 8, 2015 from 1:30 until 4:00 P.M. in the General Store on the grounds of the Shiloh Museum of Ozark History in Springdale. I hope you're looking forward to getting together, catching up on the latest news and making plans for the Missouri State Singing Convention and other events this spring. If you arrive early enough, those singers who like chicken for Sunday dinner can gather at Springdale's AQ Chicken House around noon. Just ask for the Shiloh Singers at the cashier's desk. The Shiloh Singers who attend the Missouri convention tend to stay in Washington, MO and a Friday evening supper and Sunday morning breakfast are becoming a tradition. Car pooling and room sharing are encouraged and we can work on those details on Sunday or as the convention dates get closer. As a result of the exodus to Missouri for their convention, the Shiloh Singers will be in recess on March 8, 2015 and our next regular 2nd Sunday singing will be on April 12, 2015. The Northwest Arkansas Convention is scheduled for Saturday, May 2nd in Harrison, AR at St. John's Episcopal Church. It looks like a busy schedule as we head for spring and summer. Please mark your calendar and check back for any updates. One sad announcement: Norma Dickerson's mother, Mrs. Hazel "Suzie" Dickerson passed away on Saturday, January 30th at the age of 91. A memorial service has been scheduled at Moore's Chapel in Fayetteville on Tuesday morning, February 3rd at 10:00 A.M. Mrs. Dickerson shared a love for her church and Sacred Harp singing with her daughter, Norma, who has remained steadfast in her help and support for the Shiloh Singers. Norma has helped set up before and clean up after many local events and she's supported the singers in so many different ways. We share a sacred harp connection with Norma's loss. Memorial contributions may be made to Faith in Action, 1101 North Woolsey Ave. Fayetteville, AR 72703 or Willard Walker Hospice Home, 325 East Longview St. Fayetteville, AR 72703. In which case, we hope to see each of you at the Sunday singing even more. Take care and drive safely. 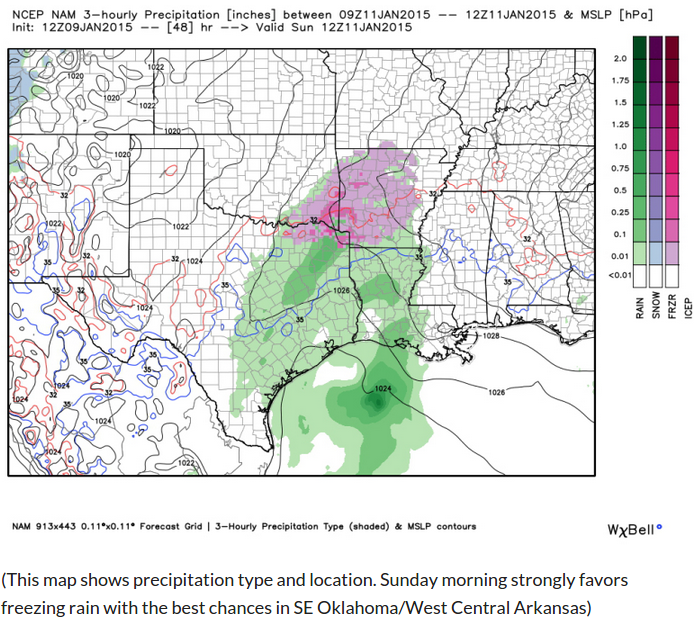 As an official sponsor of "singing in the rain" and other lost causes, I've checked the National Weather Service Forecasts for Sunday, January 11th for most major communities in and near NW Arkansas. 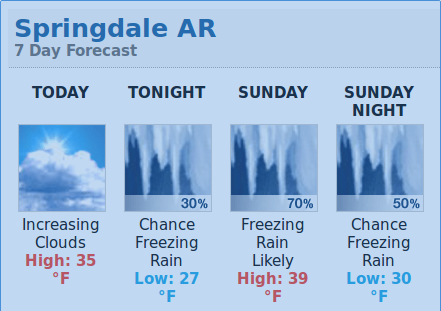 Springdale has one of the better forecasts. Things look worse or much worse to the west, north and east of Springdale and only slightly better south toward the tunnel and Alma. In the south the freezing rain should be over by 7-9 A.M. In other locations, the wizards are calling for rain or freezing rain until noon or even later. KFSM Channel 5 earlier predictions have become more serious with each new forecast. in the interest of safety, and checking with others, I've recommended that we notify the singers by email of the canceled 1/11/15 Sunday afternoon monthly singing ession at the Shiloh Museum. Others I checked with agreed. It's just not worth taiking a chance of someone cresting a hill and finding a patch of ice that survived longer than expected in the shade across the road. I've asked the museum staff to post a note on the door of the general store in case someone doesn't get the word and shows up. January 11th Singing ~ I hope everyone had a good Christmas and New Year's celebration. The first week of 2015 has seemed very short for some reason. As we get older I think we move and think a little slower and it takes more time to do the same things we used to do quickly. We may also take a little more time to remember to do things. In any case, I don't want any of you to forget the Shiloh Singers will be gathering at the General Store on Sunday, January 11, 2015 at 1:30 for a short afternoon of celebrating the new year with Sacred Harp songs and fellowship. The usual before-singing lunch at AQ's Chicken House at noon will continue for those who arrive early. Any left-over New Year's cookies or snacks are always welcomed at January singings. New singers are also welcomed, so start the year off by bringing a friend who enjoys singing. We can share the experience as easily as we share cookies and singing is better for good health any day. Questions and Answers ~ I've already had a couple of questions this month about singing at the Missouri State Convention in March and where to find more information about finding Sacred Harp singings if traveling. We can share the answers to those questions too. I've been pencilling in 2015 events. Do you know the date for the Missouri State Convention? 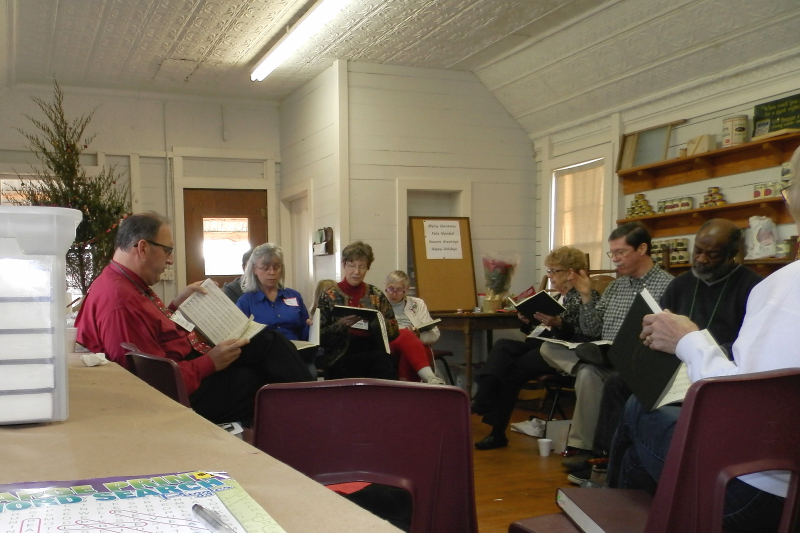 The Missouri State Sacred Harp Convention is scheduled for the "Second Sunday and Saturday before" in March of each year. That works out to Saturday, March 7th and Sunday, March 8th starting each day at 9:30. That's also our normal singing date in Springdale, so we usually declare a recess in March and hope as many as can will join other Shiloh Singers who plan to sing in Missouri. The St. Louis Singers sponsor the event and you can check their web site for updates at: http://www.stlfasola.org/ and I'll also post more info in our newsletters and web page when available. We try to encourage people to share rides and expenses to keep costs reasonable. The Missouri State Convention is more like a international event with singers from Canada to Alabama. It's an event you'll remember and want to repeat again. I am making out my calender for 2015. Would you mind sending me an email with the list of singings with dinner on the ground? I wanted to plan to attend some this year. But it's a good idea to check out both lists. Most of the all day singings have lunch or a list of places to eat close at hand, and will usually indicate the arrangements on their website or in their announcement flyer. 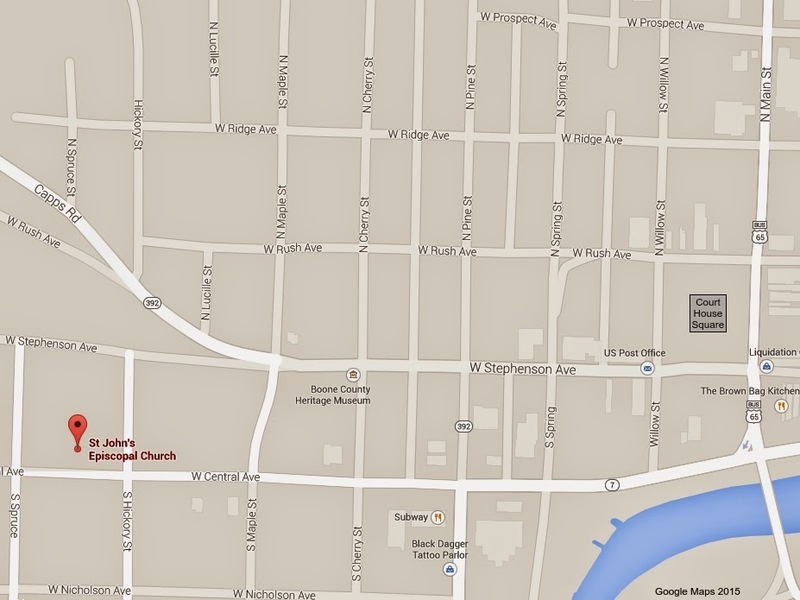 Example: Missouri usually has a map with directions to the church and nearby motels. Finally, we have several extra 2014 Minutes Books in the general store where we sing. We receive the 2015 Minutes books during the spring of the year. Be sure to get tje mew copy when it arrives. Minutes books are only updated once a year, but a subscription to the Fasola mailing lists are available at: http://www.fasola.org/community/lists/ It's not a bad idea to check the phone numbers posted in the announcements to confirm the date and locations if you need more directions. I've been on some nice country drives before, but the dates or locations are seldom changed. In those cases, the journey is the reward. Just use the "Winter Weather tab with the snow icon on the right margin of the IDrive home page to pull up two maps. One covers the road department's official opinion of road conditions and the second map covers "What's on the Road." which may be more useful information for old European rally drivers than the usual navigator's notes. The National Weather Service had a long-range forecast of a chance of rain on Sunday. Garrett Lewis and the local weather gang on KFSM Ch. 5 weather on Wednesday night didn't expect any problems as the temperatures along I-49 are expected to be above freezing. I expect I'll check both IDrive maps before leaving home on Sunday morning. I hope you'll do the same, drive safely and hope to see you in Springdale on Sunday! Well, that didn't last long. NWS and most weather forecasts are worried about freezing rain. We've canceled the January 1/11/15 singing to be on the safe side but I still thing I'll check out the idrivearkansas.com website before I go very far on Sunday morning.